The MWCC attempts to debunk "some of the most hurtful accusations” but the truth often hurts and cannot be debunked. Has the MWCC received, accepted or asked for funding from the Government? Considerable public money, time and resources have been expended upon answering questions by the proponent, meetings with the proponent and etc. The Government paid to pass the legislation the MWCC demanded in order to compulsorily acquire land for their scheme. It is also not true that the MWCC has not asked for funding for "all aspects of the project". The MWCC did ask for money from the Hobart and Genorchy councils for their mountain bike track, they say so in their Macro-economic impact study. The MWCC has not categorically stated that it will never ever "ask or accept or receive" any funding from the Government—and by the way, would a loan be "funding"? 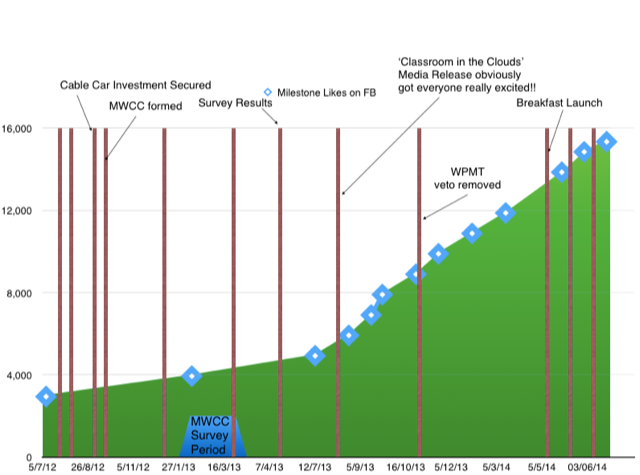 Though not relevant to conspiracy theories, the MWCC's "Commercial Failure" plan is here. + "NO CONSULTATION, NO TRANSPARENCY"
Has the MWCC continually engaged the community since 2010? MWCC are all over that tremendous echo-chamber called facebook, but the MWCC has cancelled public meetings it organised for local residents. It claims to have consulted groups that do not exist, others deny they were consulted or refute any suggestion that they are supportive. The MWCC has promised reveal after reveal—and revealed nothing. Regarding "TRANSPARENCY", the MWCC makes no response. ? + "WE HAVE FOREIGN OWNERS"
Is the company funded by Tasmanians? What is a Tasmanian? Many MWCC backers do reside in Tasmania. Others do not. But in any case, financial backing is not ownership, and the MWCC has given no undertaking to rule out foreign backing or ownership. Property developers like the MWCC rarely operate their developments. They acquire land and licences to sell to expert operators. The State Government has confirmed that the licence would be transferrable. In terms of money-making, the major beneficiaries, again according to the MWCC's Macro-economic impact statement, would not Tasmanian or even Australian, they would be foreign, with Austria being a prominent beneficiary. Was it the MWCC or its Swiss/Canadian "backers" who ended the deal? Whether the "deal" was ended by "creative disagreement" or simply "lapsed" (see newspaper clipping) is a red herring. In 2014 the MWCC attempted to persuade the public that it had convinced an international consortium of companies to fully fund their scheme. Moreover, they had triple the funds required for the task, when in fact the three Canadian companies were owned by a man of straw who by his own account held nothing more than "a side interest" in cable cars. There never was a genuine backer to walk away from. + "MATES DEALS // POLITICAL CORRUPTION"
Has the MWCC or its CEO donated to any political campaign? Is time not a donation? Is free advice not a donation? Is active cross-promotion not a donation? Are MWCC CEO Adrian Bold and (the then Minister for State Growth Matthew Groom) not mates? Did Bold not actively support Groom's re-election campaign? Did Groom not subsequently delete the photographic evidence from Facebook? Did Groom not introduce the legislation favouring the project? That's what a mate would do, isn't it? Was the crucial zone extension at the Pinnacle a gift, or did the Crown acquire it by law from the Hobart City Council and the MWCC would merely lease it? Public land, in what is effectively a National Park, at the summit of a mountain does not come up for lease very often. If a parcel of such land was acquired not by ordinary commercial agreement but compulsorily by an Act of Parliament, and if there was no tender process for subsequent reallocation but instead it was offered for the exclusive use of one privately owned corporation—is it unreasonable to say that that that is a "land grab" and "a gift"? The MWCC is a squatter. + mr nobody "NATHAN CARSWELL"
Did the MWCC's CEO Adrian Bold use the pen-name Nathan Carswell? The infamous submission to the Wellington Park Management Trust on the Pinnacle Zone Boundary Adjustment sent from a non-existent address and signed Nathan Carswell—a person who does not exist—was forensically investigated by Bob Burton here and here and reported by the ABC here. Burton could not conclude that Adrian Bold is Nathan Carswell, but his evidence for the presumption is compelling. Why the MWCC subsequently went to the trouble of confirming from the Wellington Park Management Trust that the use of a pen-name is "statutorily sanctioned" only adds to the guilty afterglow. Has the MWCC engaged a 'Like farm' to artificially boost its support? What is the explanation for 1000 new likes in 18 days? The brown Vertical lines represent MWCC media releases. The MWCC used to advertise whenever it got another 1000 "Likes" (the images have since been removed). Sceptics point to a spike in "likes" in 2013—about 1000 in 3 weeks. The only media release the MWCC put out at the time was their Classroom in the Clouds—which the media ignored. As the spurt has never been duplicated, how else do you explain it? Was the reason permission to start ground-truthing the cableway's path was provided on the eve of calling the 2018 election a logistical coincidence or a conspiratorial lurk? The Election Eve ministerial approval is not a conspiracy, it is a fact, but the MWCC offers a convincing documentary chain to show it all just happened. That conspiracy is busted, the ground-truthing itself, however, soon descended into farce. + "MILLION DOLLAR GRANT TO BREWERY"
Was a million dollars a sweetener to a landholder made in order to favour the MWCC project? This smacks of conspiracy. The government did grant Cascade one million. The MWCC claims it had no knowledge of the grant before it was announced, but the grant was, most unusually, also unheralded by the government before being given, and the letter authorising the payment, obtained under FOI, has crucial sections blacked out. A gift, yes. A bribe? Unlikely. Even if it was a bribe, it failed. The brewery refused to give any Landholder consent to the MWCC. Did the Mercury’s editor pledge his support to the MWCC? On Friday, March 4, 2016 Jude Franks, a managing director of the MWCC, wrote an email to the Minister for State Growth, Matthew Groom. She requested a meeting to get some answers, or guidance, and attached what she titled: MWCC Update. The Update reported her attendance in a meeting with The Mercury editor Matt Deighton. She asked the editor point blank if The Mercury would support the project editorially. Deighton told her, she reported, that the paper would support it “once a Government endorsed process is determined." For Franks, Groom was the g-man most likely to deliver the process that would get them endorsed. The Mercury would become a pawn. If what Franks wrote of Deighton is true, his undertaking is certainly not a promise to print fake news but it was a shameful promise, an abrogation of the essential duty of a news editor to his or her readers, to report impartially, to publish without favour.